Let’s pause for a while and consider this aside from grooming the nails for aesthetic, or at the very least, hygienic purposes, just how much attention do we pay to our nails? I would venture a guess and say, not much. However, if a woman’s hair is her crowning glory, then one’s nails should be considered as a reflection of not only cleanliness and personal hygiene, but also of overall health. Nails are made up of layers of keratin which appear smooth and translucent, with an average growth rate of 0.1mm/day or 3mm/month. While a normal fingernail takes about 6 months to grow completely, a normal toenail grows at half the rate. The shape, color, and texture of the nails, as well as the rate of nail growth, not only reflect nail health and overall health condition, but also serve as a marker in determining the time of nail trauma and in predicting treatment outcomes. Oftentimes, we neglect or overlook diseases of the nails because of this nature. You may be suffering from chronic dull pain under your toenails and ignoring it, or complain of a stubborn extra nail growth that never seems to go away no matter how often it has been filed and cut by your favorite ‘manicurista. So, how would you know when your nail needs more than just polish and color? Here are some common signs of nail conditions that may need medical attention. Nails should be smooth. If they become flaky, soft, fragile or split, then they should be evaluated. They may simply result from repeated wetting or drying or may indicate a more serious health disorder, skin disease, fungal infection or nutritional deficiency. Nails are translucent and appear pinkish due to the rich vascular network of blood vessels underneath. They should never appear brown, black, yellow, red, white or green. Changes in nail color may indicate an ongoing infection, general health problem or congenital disease. It could also be due to a new growth which may be cancerous or simply a result from nail polish reactions or medications. Nails are rectangular and flat. When the shape of the nail changes, it is usually due to other factors like ill-fitting footwear, improper nail trimming, or due to an abnormal bone underneath. Most common causes of pain are infection and ingrown nails. Infections could easily be treated with antibiotics and ingrown nails are often treated surgically. If properly done, all it takes is one short procedure and the ingrown nail will never bother you again. Bleeding from the nail bed could make your nail appear red or black, depending on duration from the time of insult. Often, they are due to trauma, but not all. Other skin conditions and medical problems could result to bleeding and these should be considered if there is no trauma involved. Infection of the nail can also result to yellow or green discharge. Cancer of the nail does exist and it is not as rare as you think. It often mimics common nail conditions and can be overlooked. Under trained eyes, nail disorders are easily detected and can be treated. However, one must be watchful and not wait to consult with a board-certified dermatologist who can best evaluate, manage and treat the nail condition. 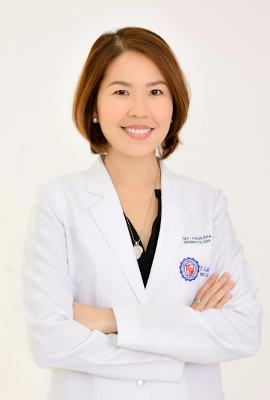 Dr. CAROLYN CHUA-AGUILERA, MD, FPDS is a graduate of St. Luke’s College of Medicine-William H. Quasha Memorial. She finished her dermatology residency at Jose R. Reyes Memorial Medical Center and subspecialty training for Nail Pathology and Surgery at the Hospital of University of Pennsylvania, Philadelphia and Hospital of University of Berne, Switzerland. She is a fellow of the Philippine Dermatological Society and a member of the Council for Nail Disorders and European Nail Society.